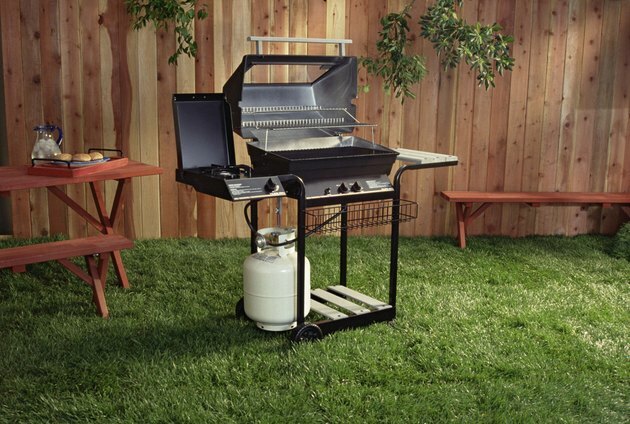 Gas grills with piezoelectric or electronic ignition light at the push of a button. Both types of ignitors generate a hot spark that lights the grill, but they create the spark in different ways. Piezoelectric starters generate one spark per push. Electronic starters spark repeatedly when activated. Several small problems could prevent grills from lighting normally. Owner's manuals outline troubleshooting procedures. Follow these steps exactly to avoid gas explosions. Turn the main gas valve off before attempting ignitor repairs. Cleaning the grill regularly prevents many ignition problems. When the grill operator opens the valve to a burner, gas enters a metal tube leading to the ignitor's spark gap. The spark sets the gas alight, and the flame travels back to the burner through the tube. Piezoelectric ignitors mechanically compress a piezoelectric crystal that generates a voltage when under pressure. Electronic ignitors activate an oscillator circuit, charging a capacitor until voltage climbs high enough to jump across the spark gap. Piezoelectric ignitors need no batteries, but the generating crystal could break. Electronic ignitors depend on batteries for power. Dead batteries or corroded contacts prevent normal operation. The owner's manual gives procedures specific to the model of grill, but troubleshooting steps vary only slightly by model. Make sure the tank has fuel and the main valve is open. If the grill fails to light when operated properly, check the burners by lighting manually with a match. Most grills include a metal match holder and a lighting port. If the grill lights with a match, the problem lies in the ignitor. Fuel could fail to reach the ignitor because of debris in the lighting tubes. Spiders, wasps or other insects sometimes build nests that block the tubes. The sparking tip of the ignitor must align with the opening of the lighting tube or fuel may not reach the spark gap. With the ignitor in proper position, pressing the button should create a visible spark. Debris in the spark gap could short out the electrode. Clean the gap with a soft brush, and allow the ignitor to dry completely before testing again. Pushing the ignitor button once should cause a spark. If a spark appears, follow ordinary lighting procedures to start the grill. If a clean piezoelectric starter creates no spark, replace the ignitor module. If clean and correctly aligned electronic ignitors fail to produce sparks, check the batteries first. If new batteries don't fix the problem, check the wiring that connects the battery box to the ignitor. Look for loose or corroded connections and for broken or chewed wires. Gnawing rodents sometimes sever ignitor wires. If a voltmeter shows power at the input to the ignitor module, the battery box and connections work properly. When electronic ignitors with a good power supply and a clean spark gap still fail to spark, electronic components could be at fault. Replace the ignitor to correct the problem.